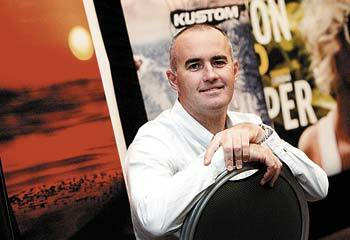 American sales were up 33.5% in Billabong’s financial half of the year ending December 31, 2006 with a net profit of AUS$90.5 million. The group said that the first half result is an improvement of the prior corresponding result of $79.5 million, as the group recorded sales revenue of $610.7 million, which was up 26.1% from $484.3 million. . . . Looking forward, Mr O’Neill said that, in the absence of any unforeseen circumstances, the continued global momentum and strong demand is expected to deliver the full year earnings per share growth target of 15%. And the stock went up 45 cents to AUS$17.85. And the Courier Mail was all upbeat. But that was yesterday. Today according to The Australian the stock tumbled almost four percent. Weird, huh? For the fourth quarter, sales rose 37% from a year earlier to $56.6 million. Analysts had expected about $55 million. . . Net income came in at $7.6 million. Analysts on average expected $7.3 million. They did add that results for the current quarter could fall short of expections, and that some European expansion could cut into first quarter profits. . . we blame the weather.